Our Monterey Pinot Noir is blended from a few acres in each of four vineyards scattered along benchlands near the Santa Lucia Highlands that are subject to the cool, foggy influence of Monterey Bay. We blend our Sonoma Coast Pinot Noir from select blocks in vineyards located in the Petaluma Gap, Carneros and Russian River appellations. Rodgers Creek Vineyard is sourced from a single site high on a ridge exposed to extremes of both wind and fog, from the Pacific as well as San Francisco Bay. Planted on benchlands and sandy, well-drained sites in Monterey County, our vineyards dip in and out of the fog line during the ripening season. Our Pinot Noirs are harvested in early morning, gently de-stemmed, then cold-soaked briefly to intensify color and flavor. After warm fermentations in stainless steel tanks to encourage extraction, the wines are gently pressed and put into both new and neutral French oak barrels, medium toast with medium to tight grain, for nine to 14 months of aging on the lees. Neutral barrels provide an environment for rich lees development, while new barrels contribute a round sweetness to enhance natural perfume and texture, all without overpowering the fruit. Night and early morning picking preserves freshness in our Chardonnay, while gentle whole berry pressing maximizes quality. Some lots are aged in French oak barrels while others age on the lees in stainless steel tanks, which preserves freshness and vibrancy. About 75% of the lots undergo complete malolactic fermentation to develop richness and body while maintaining an appealing acidity balance. 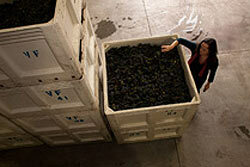 Alison makes Garnet wines as a true expressions of their appellations. 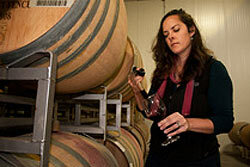 "When blending Garnet, I get to choose from the ripe, black cherries of Stanly Ranch on the eastern edge of Carneros, the red fruit and acid backbone of Diamond Ranch and Champlin Creek, and finally, the dark, brooding spiciness of Rodger's Creek on the appellation's western border. These vineyards offer an abundance of gifts."